President Muhammadu Buhari will Tuesday morning, at the Presidential Villa, Abuja, confer Nigeria’s highest honour to the acclaimed winner of June 12, 1993 election, late Moshood Abiola. While Mr Abiola will be given a posthumous award of the Grand Commander of the Federal Republic (GCFR), his then running mate, Babagana Kingibe, will be awarded the Grand Commander of the Order of the Niger (GCON). Also, late human rights activist and senior lawyer, Gani Fawehinmi, will be awarded the GCON. Mr Buhari had last week announced that henceforth, Democracy Day in Nigeria will be celebrated on June 12 and not May 29 each year. 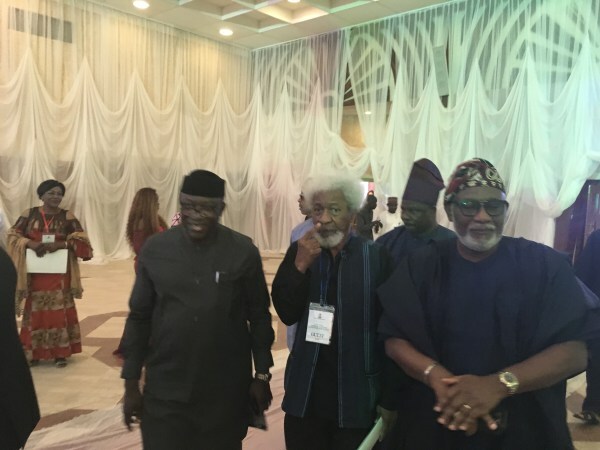 Already, several individuals and groups who played prominent roles pushing for the actualisation of June 12 and its proclamation as Nigeria’s Democracy Day have been invited to witness the event, which will hold inside the conference centre of State House Villa, Abuja. Owojela’s Blog will bring you live updates of the event. The Secretary to the Government of the Federation (SGF) Boss Mustapha is currently given the opening remarks and welcoming all personalities present. Amongst those here are President Muhammadu Buhari, Vice President Yemi Osinbajo, Bola Tinubu, Bisi Akande, Wole Soyinka and several states governors. Mr Mustapha says the conferment of honours on Mr Abiola and others was to further establish the fundamental principles of the Buhari administration. “Nation building requires the sacrifice of all citizens, we must therefore imbibe the moral rectitude to embrace our past,” he said. “We must, therefore, recognise the heroes of our democracy,” he added. June 12, more than any other events in Nigeria’s history symbolises strong democratic principles and experience, Mr Mustapha says. He adds that the president has placed history in the right perspective by recognising declaring June 12 as a Democracy Day and recognising its key figures. He thanks groups and individuals who have played roles in entrenching Nigeria’s democratic experience for the past 20 years of uninterrupted republic. Mr Mustapha says an announcement is underway for the list of individuals who have played critical roles in furthering the cause of democracy. Kola Abiola, first son of M.K.O., and Abba Kyari, the chief of staff to the president, are amongst those present taking seats at the front row. President Muhammadu Buhari has been called to the stage. Ganiyat Fawehinmi, wife of the late rights activist, will be receiving the national honours on behalf of the family, coming nearly nine years after his death. In 2008, Mr Fawehinmi denied national honours when announced for him by former President Umar Yar’Adua. He died in September 2009 and his family rejected a similar honour during Nigeria’s centenary celebrations in 2014. The family said last week the latest award appropriately honoured the memory of Mr Fawehinmi and, therefore, accepted it from Mr Buhari. Mr Buhari has now given the posthumous award of the Grand Commander of the Order of Niger on Mr Fawhinmi as received by his wife. The next person on the stage now is Mr Kingibe, who is present to receive the award in person. 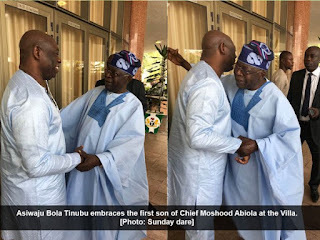 Mr Kingibe was the running mate of Mr Abiola in the botched 1993 elections. A career diplomat, Mr Kingibe has been in politics since the second republic, 1979-1983. 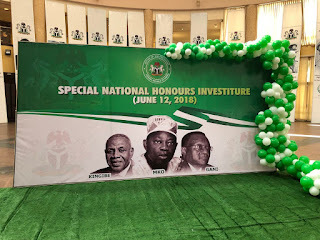 Kola Abiola is now on the podium standing beside Mr Buhari to receive the posthumous award of the Grand Commander of the Federal Republic, Nigeria’s highest honour, on behalf of the family. The late M.K.O. had a rich background in business, establishing several banks in his lifetime. He was also the publisher of the defunct National Concord, which held sway as Nigeria’s topmost newspaper in the 1980s and 1990s. He joined active politics since the second republic, but became prominent under the military administration of Ibrahim Babangida, 1985-93. BREAKING: Buhari confers Nigera’s national honours on M.K.O. Abiola. Kola Abiola has now received the award on behalf of the family. Mr Buhari now delivering his speech. “The government (of Ibrahim Babangida) inexplicably cancelled the (June 12, 1993) election when it was clear who was the winner. “We cannot right the past but we can at least assuage our feelings. “Nigerians will no longer tolerate such perversion of justice. “Our decision to honour June 12 is in national interest,” the president says. Former President Olusegun Obasanjo is not at the event. His spokesperson, Kehinde Akinyemi, tells PREMIUM TIMES the former president is currently not in the country. 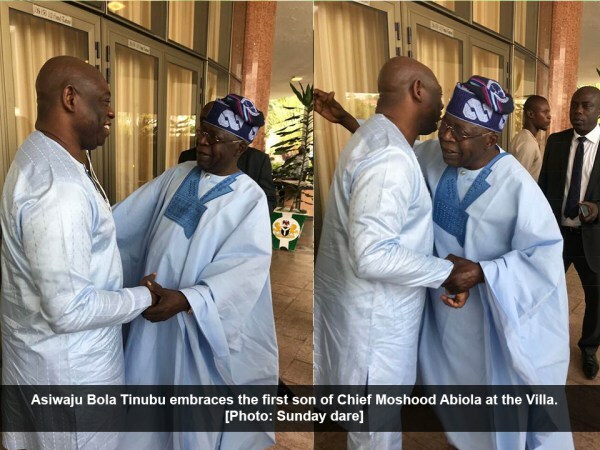 But the spokesperson could not say whether or not Mr Obasanjo would have attended the event if he were to be in town. Mr Babangida could not make it, either. The former military leader has been battling health crisis in recent years, and made several trips to Germany and Switzerland for treatments. June 12, 1993 was the day Nigerians chose the path to national unity, rather than ethnic eyes. Mr Kingibe is very close to Mr Buhari, and he is amongst his closest alies at the State House. He says the decision to honour Mr Abiola and recognise June 12 came “naturally” to the president. Frank Kokori, a frontline labour leader who was amongst the advocates of June 12, says Mr Buhari was the least person expected to honour Mr Abiola’s memory, saying it was a confirmation that the president “has a great soul”. “I just felt what sort of country is this. Like my personal experience as one of the most famous prisoner of conscience in the world, I saw that my country did not even appreciate the four years I spent in one of the worst cells in the world. And we did all these for our country and the country did not recognise us,” Mr Kokori tells reporters on the sidelines of the event. “So, now we are happy and we are very grateful to our President, the least president we expected who should have done this, Muhammadu Buhari. We thought people like Obasanjo should have done that for us long time ago. There was so much pressure not Muhammadu Buhari, we least expected it, so in doing it for us, he has a great soul and we appreciate it,” he added. Mohammed Fawehinmi, my father would have accepted it. Mr Fawehinmi’s eldest son, Mohammed, says his late father would have accepted the award because June 12 was actualised. The late Mr Fawehinmi was amongst the biggest voices for the realisation of Mr Abiola’s mandate. “I feel very elated, I feel very proud, my family feels very honored that all the suffering was not in vain and that the Nigerian people have a chance of better governance in future,” Mohammed Fawehinmi says to reporterss. “I know he would have taken it, I know my father more than anybody. There are two reasons why he would have taken it,” Mr Fawehinmi says in response to those insinuating that his father would have rejected the award in principle. “One, because June 12 was actualised. Two, because M.K.O. Abiola was recognised as president-elect. And you can see from the suggestion at the Senate that they are going to eventually declare the election result and he is going to be given all his benefits after 25 years which he has lost. “So, for that reason that is victory for him because he went through hell and high waters to make sure that June 12 was actualised,” he says. Ganiyat Fawehinmi, the later activist’s wife who accepted the honour on behalf of the family, recalled the past ordeal of the family that now makes today a remarkable one. “I was a bit disturbed. Every time the security will come, turn our house upside down, even his office was broken into, they took away many files during Mr Babangida’s regime and they were not returned till date. “So I just thanked God that I am alive to witness today and I know that my husband will turn in the grave for this June 12 that is being actualised because he really fought and died for it. “I believe God has a purpose for it, I believe that is how God wants it because you can’t run a race ahead of God. So, God has a purpose of actualising it today which is exactly 25 years after Hole ‘93 when Abiola wanted to be the President,” Mrs Fawehinmi tells reporters outside the event hall. Former governor of Ogun State, Segun Osoba, says Mr Buhari demonstrated courage by honouring Mr Abiola and others. “I was just telling Chief Kokori that the fact that the two of us our alive to witness the event of today is a thing of joy. Because, Kokori became the last man standing when everybody was taken And I was wrongly accused which is not true. So I am happy that we are all alive today. “The significance of what we are doing today is that the president has the courage to do what others failed to do. “Secondly, he has shown tremendous courage in recognising Abiola as late president of this country because I hate the language the presumed winner of the annulled June 12 election, with this declaration of honour of GCFR, which is reserved for President and GCON for Vice President and other eminent Nigerians, shows that the president has answered our appeals over the years and I thank God I am still alive,” Mr Osoba says to reporters. Mr Abiola is the second Nigerians to be honoured with the award of GCFR despite having not been president. Obafemi Awolowo, premier of the defunct Western Nigeria, was awarded GCFR by former President Shehu Shagari in 1982. Mr Buhari has not declared Mr Abiola a former president, but activists are still demanding that this must be done to complete the process of honouring his memory. Mr Kingibe, in his acceptance speech, describes M.K.O. as the messiah Nigerians never had. Kola Abiola yielded the acceptance speech to his sister, Hafsat Abilla-Costello. Mrs Abiola-Costello, says Mr Buhari was amonst the least expected person to honour Mr Abiola because of their unsavoury history. She accepts the honour on behalf of the family and says it is worth it, especially for a family which gave a lot. Her mother, Kudirat Abiola, was amonst those who died struggling to reclaim the mandate given to Mr Abiola in the 1993 election. She was killed in a suspected assassination in Lagos in 1996. Ayo Obe, a rights campaigner, also takes the stage to announce the names of those who died in the civil society struggle. Alfred Rewane, a nationalist, was also assassinated during the struggle by suspected elements of the state under Sani Abacha. Bayo Onanuga, who speaks for the media’s aspect of the June 12 struggle, says it is never too late to right the wrong of history. He says Mr Buhari did well by recognising MKO Abiola and the spirit of June 12, saying he should ignore detractors, most of whom were never a part of the struggle to begin with. Mr Onanuga, who worked at TheNews Magazine during the June 12 struggle, is now the head of News Agency of Nigeria, appointed by Mr Buhari. He says the June 12 that is currently being celebrated brought Nigerians together was grossly violated and, therefore, set Nigeria back decades. He says Mr Buhari’s final recognition of June 12 shows that the struggle cannot be buried. Amongst the royal fathers at the event are Alaafin of Oyo, Lamidi Adeyemi, and Alake of Egbaland, Aremu Gbadebo. Frank Kokori, a labour leader, says the resistance that followed the annulment of June 12 was pivotal. “You do not remove a ruthless dictator by carrying placards. You don’t do that at the Elysee Palace, they will listen to you. You do that at the Buckingham Palace, they will listen to you. You do that at the White House, they will listen to you,” he says. Mr Kokori says his labour comrades did a lot of work as the arrowhead of the struggle against military dictator in the 1990s. Mr Kokori drops a bombshell, saying he was appointed by Mr Buhari to head the Nigerian Social Insurance Trust Fund nine months ago, but has not been sworn into office. “I was treated with such ignominy,” he says. Femi Falana says he was detained at Kuje Prisons during the June 12 struggle. He calls Mr Babangida “a criminal” and appreciates Mr Buhari for the historic decision. “We had seven presidents that pretended the June 12 did not exist,” the rights activist says. “I urge you to direct all security of all security forces in Nigeria, including the police, to respect the fundamental rights ot Nigerians in the spirit of June 12,” Mr Falana adds. He also demands an end to the senseless killings across Nigeria. His comments come against the backdrop of recent violent attacks in central Nigeria and other parts of the country, as well as the attacks on everyday citizens linked to police Special Anti-Robbery Squad, SARS.